Organist William Trafka, formerly of St. Bartholomew’s Church in New York City, and currently organist of Christ Church, Ridgewood, N.J. presented a lecture-recital on the life and works of J.S. Bach at St. James’s, West Hartford on Saturday, March 16. The event reprised a similar presentation given for the young people of the POE at Trinity College here in Hartford in the Summer of 2017. In this expanded version of his presentation, Trafka first gave a thumbnail sketch of the chronology and geography of the composer’s life, then began to delve into the developing style of the master as it unfolded. As his first musical illustration, he played the complete Chorale-Partita: “O Gott, du frommer Gott,” BWV 767, one of the composer’s earliest important works. The frequently spare texture of the variations, and the apt registration of the artist, afforded a chance to hear the beautifully voiced solo reeds and flues of the recently renovated and expanded Austin organ of St. James’s: an instrument beautifully matched to the church’s acoustic. Before launching into the “Arnstadt” Prelude and Fugue in C minor, BWV 549, Trafka discussed the tonal simplicity of Bach’s early approach to fugal composition and the influences of Buxtehude and Georg Böhm. It was particularly informative to be given the opportunity to listen to this piece in contrast to the later and more mature Prelude and Fugue, BWV 546 in the same key: the work with which the recital concluded. Another example of Bach’s earlier, still developing style was his setting of “In Dulci Jubilo,” BWV 729, known to many of us as the obligatory Christmas Eve postlude for the annual King’s College Service of Lessons and Carols. Trafka referenced a quote from a reprimand given Bach by church authorities for something like “various unusual additions to the chorales sung during service.” He suggested that this setting may be the perfect illustration of what the composer was apt to do extempore, with phrases of the chorale interrupted by elaborate passagework. The organist continued with “Ein feste burg ist unser Gott, “BWV 720, a similar example of Bach’s early chorale prelude style. As their work became available in print from the forward-looking Dutch publishers of the early 1700s, music of Vivaldi and other Italian masters exerted a strong influence throughout Europe. Bach’s study of this music led to an even more profound result than his excellent transcriptions of Vivaldi string concerti for organ would indicate. Trafka maintains that Vivaldi’s influence, in particular, revolutionized Bach’s style in terms of motivic consistency, continuous motoric rhythm, and a sense of inevitability in his melodic and harmonic flow. To illustrate, he gave a fine performance of the finale of the Concerto in d minor (after Vivaldi), BWV 596, a work from the Italian’s Op. 3 collection, L’estro Armonico (Harmonic Fancy). Importantly, Bach’ spiritual life was dwelt upon at some length by Trafka. Notations in the composer’s copy of a biblical commentary, indicate that he felt his to be a Levitical calling; a God-given vocation akin to that outlined for King David’s musicians in I Chronicles, chapter 25 of the Old Testament. The large audience, who packed the organ loft to capacity, were treated next to a moving reading of “O Mensch bewein,” BWV 622, one of the small masterpieces of the Orgelbüchlein. Our performer observed that the ability to improvise chorale preludes of this type was and is an expected part of the German organist’s skills up to the present day. The recital continued with the popular Prelude and Fugue in G major, BWV 541 which interjected some major mode cheer amid the predominantly minor key music surrounding it. This was followed by a Trio in D minor, BWV 583, a lesser known work in the same mold, but not part of, Bach’s well-known set of trio sonatas. The important Clavierübung, Part III, also known as the German Organ Mass was represented with a performance of the Chorale Prelude “Dies sind die heil’gen zehn Gebot,” (These are the ten Commandments) BWV 678, a piece in which a certain repeated chromatic turn of phrase almost foreshadows Brahms. At the conclusion of the final, imposing Prelude and Fugue in c minor, BWV 546, the large and appreciative audience gave Mr. Trafka a well-deserved ovation for a well- played, thought-provoking and thoroughly enjoyable presentation. 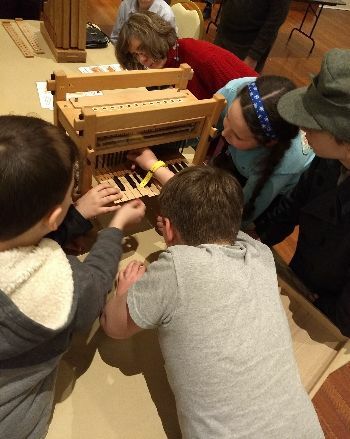 The chapter’s OrgelKids instrument has started its touring around the state with a March 1-3 weekend event at First Church of Christ, Congregational in Farmington where chapter member Edward Clark is Minister of Music. The event was part of the year long celebration of the 50th anniversary of the installation of the church’s Holtkamp organ. 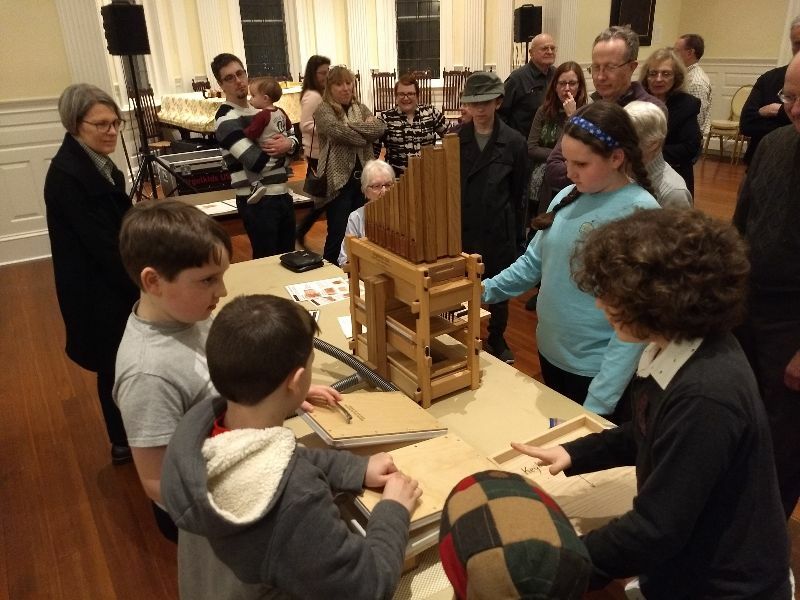 The church’s young people assembled the kit in about thirty five minutes and after giving everyone a chance to try playing and pumping the organ, the OrgelKids instrument and all the people moved across the church campus to the Meetinghouse to hear the world premier of a piece commissioned by the church for this occasion. The composer, Tom Schmutzler, is also a Hartford Chapter member even though he now lives in North Carolina. His piece, David and Goliath; a musical fantasy for OrgelKids organ and Organ, was performed by a local middle school aged boy on the OrgelKids (David) and Ed Clark on the big organ (Goliath) and proved to be lots of fun and received a rousing ovation. On Sunday morning David and Goliath was repeated as the Children’s Message. 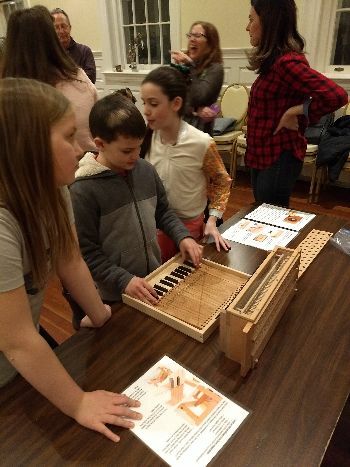 The OrgelKids instrument was used throughout the service playing the recorder part of Alessandreo Scarlatti’s Quartetto in F for blockflöte, two violins and basso continuo as well as movements from Loeillet de Gant’s Sonata in A Minor, Op. 1, No. 3 for blockflöte and basso continuo. Accompanying instruments included a string trio of middle school musicians and harpsichord. 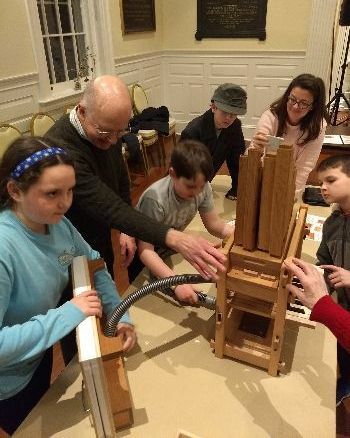 Next the OrgelKids kit moves on to the middle school in Enfield where chapter member Susan Carroll will help her husband introduce the organ to his students. The frame is ready for assembly, the pipes are ready for sorting by type and by size, and the toe board is waiting to receive the pipes. Attaching the trackers to the keyboard is one of the hardest tasks, but it’s no problem for these kids! The last step: attaching the bellows to the wind reservoir. Testing it out and learning how to pump the bellows. 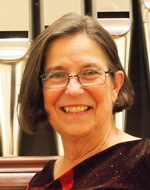 Asylum Hill Congregational Church, 814 Asylum Ave., Hartford.We are very excited to welcome back concert organist Faythe Freese. Faythe served as faculty on the 2017 Pipe Organ Encounter held at Trinity College, and many of you will remember her fiery performance of the Franck A minor Choral. Two years later, Faythe returns to perform a full-length recital. Saturday, April 6 at 10:00 am. Asylum Hill Congregational Church, 814 Asylum Ave., Hartford. One inevitable fact of being a church musician is the relentless recurrence of Sunday. As soon as Sunday winds down, before you know it, it’s Sunday. Preparing all the music required in a worship service—organ voluntaries, hymns, anthems, psalms—takes time. Often, one’s schedule will only allow a cursory approach—a quick run-through of a piece, rather than a systematic, thorough rehearsal. But, with some discipline and planning, this can be improved upon. Firstly, begin working on the music sooner rather than later. There is no harm in having a piece ready to go a few weeks in advance of its appearance in the service. Choir members will feel confident and prepared, rather than worried and tentative. Not only does the music come out better, everyone involved is happier—always a good thing! There’s the temptation to attempt more than is practically possible. It’s laudable to set high goals, but the journey to achieve them needs to be carefully considered. A movement of a Bach cantata in German—new to the singers—is obviously going to take much more rehearsal time than Stainer’s God So Loved the World. Start the Bach six weeks before the time it’s programmed, not two weeks before. Choirs are generally open to challenging music if they are given the time to figure it out. Be ready to “call an audible.” That anthem or organ prelude you had planned for Advent 3 may need to be pulled and replaced with something that can be polished up in about ten minutes. There is no good reason to present music that isn’t ready. It may have been the perfect fit for the day’s lectionary, but if it isn’t done well, what’s the point? Sometimes, bad weather creates this situation; a snowstorm keeps two thirds of the choir home, and the anthem isn’t working with the diehards who showed up. Better to sing a hymn that sounds presentable. And, don’t get too comfortable. Just when you think you’re in control…Holy Week arrives to keep things interesting! The 2008 Dobson organ at St. Peter Claver Church in West Hartford is one of very few tracker organs in the greater Hartford area and the A.G.O. members’ recital on Friday evening, January 25th provided an opportunity to hear it put through its paces in a program of music of widely varying musical styles. The music of Buxtehude figured prominently in the program with Scott Lamlein of St. John’s, West Hartford, opening with a vigorous and assured performance of the Präludium und Fuga in d minor. Later in the program, Michelle Horsley of South Church, New Britain, offered a fine performance of the Buxtehude Präludium und Fuga in f sharp minor. For listeners more familiar with the preludes and fugues of Bach, Buxtehude’s approach to the form stands in stark contrast to that of the younger master who, as a youth of twenty, made his famous pilgrimage of 250 miles from Arnstadt to Lübeck to hear the older man play. Buxtehude’s approach tends to be episodic, with prelude giving way to fugue with no ceremonious cadence announcing the end of the prelude; the fugue freely seasoned with pedal solos and “free fantasy” sections unrelated to initial thematic material. The result is brilliant and arresting. Kari Miller, of Simsbury Methodist gave us some Bach to allow comparison; a well-executed account of the Prelude and Fugue in C major BWV 545. In this early work of Bach, revised in his later years, the unique character of his prelude and fugue style is on full display. While Buxtehude and Bach may be the expected fare for a recital on a tracker organ with no electric stop action or memory, Messiaen made an unexpected and welcome appearance at the hands of Ms. Horsley. Les Bergers (The Shepherds) from La Nativité proved an excellent choice for this organ as it features sections with uniform registration and a chance to listen carefully to the flutes, mutations and solo reeds evoking the piping of the Judean shepherds. Contemporary American composer Dan Locklair composed his Salem Sonata on commission for The Home Moravian Church in Salem, North Carolina in 2003. 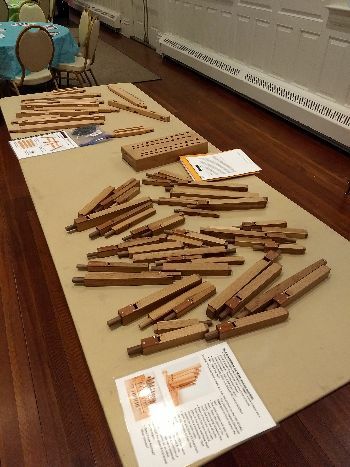 Nathan Lively of St. John’s Lutheran, Stamford gave an arresting performance of the work in which he cleverly arranged the second movement to include and demonstrate the Orgelkids small tracker organ which was played by Susan Carroll of Asylum Hill Church, Hartford. Locklair based his sonata on two early Moravian hymn tunes, “Gregor’s 97th and “Almsgiving” and the result is an appealing work with a folksy, rhythmic and thoroughly American character. Returning to the Germanic lineage of organ music, the recital continued with Hindemith’s Sonata No. 2. This, the most neo-classical (or neo-baroque, if you wish) of the composer’s three organ sonatas consists of a quick opening movement with a captivating returning motto theme, a middle movement in a Siciliano rhythm and a Fugue for finale. It was an excellent choice for this organ and was well played by Noah Smith of First Church of Christ, Suffield. Cheryl Wadsworth brought the recital to a close with more 20th century music: a fine performance of the rarely heard Prelude and Fugue from “Five Studies in the Form of a Sonata” by John Cook (1918-1984). This British born organist and composer spent most of his career in Canada and the U.S. and is perhaps best known for his ubiquitous “Fanfare” for organ. The lesser known “Five Studies” date from his Canadian years and are dedicated to Healey Willan, a fellow British-born Canadian. The music itself, as Ms. Wadsworth mentioned in her remarks to the audience, owes much to the influence of Hindemith which was immediately evident amid flashes of the unique voice of Cook himself as the music progressed. A nice follow-up to the Hindemith Sonata, the work provided a satisfying end to an evening of fine organ music amply demonstrating the wealth of talent in our Greater Hartford A.G.O. Chapter. Two of our members have recently begun interim faculty appointments at prestigious institutions: Christa Rakich at Oberlin and Ezequiel Menendez at Holy Cross. January is Winter Term at Oberlin, so I haven’t started teaching individual students yet. I did teach 19 half-hour lessons on my 2 interview days, though, so I’ve met pretty much everyone, and have an idea of each student’s capabilities and needs. Very impressive. It’s going to be a fun semester, and I’m going to hear lots of great organ playing. As impressive as the students are the facilities: 33 organs on campus, many in practice rooms or studios, some of the larger ones in concert halls or church/chapels. I was lucky to hear faculty member Jonathan Moyer’s performance of the whole Clavierübung III on the big north-German style Flentrop in Warner Concert Hall. Magnificent playing on a magnificent organ. The Cavaillé-Coll style Fisk in Finney Chapel is the other “famous” organ on campus. Organ students host an “Organ Pump” there at the stroke of midnight on the final Friday of each month. The event is an unpredictable mix of musicianship and mayhem that attracts the general public. For the final piece, the audience is invited to sprawl out on the stage to feel the thunder when Opus 116 rattles the floorboards. But some of the smaller organs are even more intriguing: the Bozemann-Gibson Silbermann style organ in nearby Peace Community Church, for example, or the 1/4-comma meantone Brombaugh organ in Fairchild Chapel, or the recently acquired Greg Harrold 18th-century style Spanish organ. I am teaching at Holy Cross College. I started in November. There are three organ students. They all received full tuition scholarships and are excellent musicians. The organ is amazing as you know. My title there is: Distinguished Visiting Scholar. I am part-time at the College and continue as full-time Director of Music of the Archdiocese of Hartford. I just celebrated my 20th Anniversary at the Archdiocese and the Cathedral. The Organ Scholarship is a four-year, full tuition, scholarship, renewable on a yearly basis, offered to a high school senior who will major in music or double major in music and another discipline. The recipient of this scholarship will have at his/her disposal the 1985 four manual, 50-stop mechanical action organ built by Taylor & Boody Organ builders, located in the beautiful St. Joseph Memorial Chapel.